I love Beth Moore and Max Lucado's books as well. The Boundaries series by Henry Cloud and John Townsend. Also, The Secret Things of God (the Christian version of The Secret) by Dr. Henry Cloud. 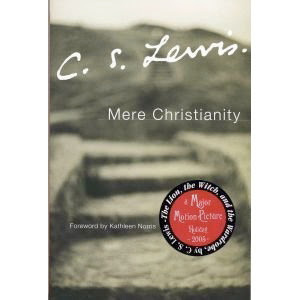 Till We Have Faces is another Lewis one I loved, although more philosophically Christian than overtly theological. Also, FYI, I have a Kindle. I adore it although I'm not a big Amazon fan. I'll look at a Nook if I decide to buy another eReader. Regardless of whether you want to shell out the $ for an eReader, you can download a Kindle or Nook application from Amazon or Barnes and Noble respectively and order any of their eBooks that way to read on your laptop. If you do purchase a reader in the future, those titles you already bought will be available on it. 1. Download public domain books for free (so does Google, but I prefer reading them on Kindle than a computer because it is more "booklike"). Think everything by Jane Austen...free. Scarlet Pimpernel...free. Dracula...free. The Odyssey...you get the idea. 2. Carry every eBook I've bought through Amazon anywhere I go. I have seventy five or so titles so far but for space challenged living and travel you can't beat it. 3. Can't sleep? I can buy a book at 2 am and start reading at 2:01. 4. If I want to read in the tub or at the pool, I just slide it into a ziploc bag. This makes it in actuality more waterproof than a traditional print book, to which many water ruffled pages in my book collection bear silent witness. 5. I've also found that it is more comfortable to hold than a book. It's lighter and I don't have to hold it open. There are still some kinks, like I can't organize my books by genre, favorites, author, whatever, but I think those things are in the pipe. On the whole, I'd recommend one. They are so easy and convenient I've found that I do have time to read. In the check out at the grocery, stopped behind a wreck on the interstate, in the ten minutes leftover between popping rolls in the oven and putting dinner on the table. I always have my book(s) handy and right on the page where I left off. GREAT recs, Kim! I totally agree about all the ones that I have read and I am eager to check out those that I have not. My most favorite devotional is "Come Away My Beloved" by Frances Roberts. I mean, it is like she opened my journal and decided to write encouraging letters to me. Doesn't get better than that. Make sure you check out the updated version though, it is much easier to read. also, i love love Andrew Murray and Francis Frangipane. My hubby loved The Great Divorce. I just bought Traveling Mercies. Thanks for sharing a list! Loved "Breaking Free" by Beth Moore. "Inside Out" by Larry Crabb......tough read but oh so good. "Waking the Dead" by John Eldridge was life transforming for me as well. I love to read any biography out there - and am currently reading J.R. Tolkiens biography. I am also reading (as a morning devotional), "Experiencing the depths of Jesus Christ" by Jeanne Guyon (written in the 17th century). This is currently my favorite book on prayer and resting in Christ alone. I also read (and re-read) C.S. Lewis's books and Jane Austen's books. Grateful that you made this list, will make it easier when I am in the bookstore and looking. Was wonderful to meet you. You must hear it a lot, but you can easily pass as Katherine's sister... :) You are all soooo pretty! I've read so many books over the last six years, but these are the ones I've read over and over again. Many lines are underlined, highlighted and circled. Notes and prayers are written in the margins. They have become prayer journals. God has used them to reveal His love and grace, and for my healing. I have several books written by Jeanne Guyon. They are on my re-reading list for this summer. I'm in the middle of the most amazing Bible study, One in a Million by Priscilla Shirer. I can't recommend it enough. I am always so amazed at how desperate He is to show Himself to us. What a God! It's a fictional story about a man whose daughter was tragically murdered and his journey to re-turn to God after turning away from him. In the book, he is able to confront God and get the answers he needs to help him heal. It's about overcoming "the great sadness" associated with losing someone you love and it answers the question: "Where is God in a world so filled with unspeakable pain?". It's one of the most remarkable books I've ever read. Thanks for the wonderful suggestions Kim!